Darwin's 200th Birthday Dinner: Transitional Species a la carte! I usually try to steer clear of the Evolution vs. Creation debate. OK, I try to stay out of it on this blog. But the 200th Birthday of Charles Darwin seems to have generated at lease as much creationish flak as evolutionist jubilation. One argument that truly baffles me is the assertion that no transitional species are in evidence to support the idea of evolution. I'm not sure what rock one would have to live under to suffer that affliction, er idea, but no matter. The power of Google shall set you free! Would you like those transitional species fossilized, or served live? For species of the fossilized kind, we'll start with whales. There are a number of very good fossils representing a transition from land to sea for this magnificent mammal. 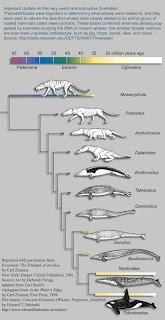 Ranging from kutchicetus and ambulocetus to the more whale-like dorudon. Actually, there are a number of extinct species in the cetacean family that represent significant transition as you can see in this illustration by Carl Zimmer. There are some wonderful articles available online about cetacean evolution at Wikipedia and Darwinia. But let's not get ahead of ourselves. A great deal of doubt about evolution centers on human evolution and the supposed lack of fossils. Again, I'm flummoxed. Ahem. And also, cough. Lots of fossils. Anyway, I could go on, but maybe you like your transitional species alive and kicking. Or swimming, as the case may be. Now for me personally, lobe-finned-fishes are enough, and lung-fish plenty more. But you may want some more visually persuasive examples. Consider for a moment the playful otter. Moreover, consider the otter together with the seal, the sea-lion, and the walrus, coo coo c'choo. Lets not forget those magnificent manatees, or hip hippos. Remember our friends the whales? Evolution isn't just a thing of the past. It's a thing of right now. Just like the biosphere itself, evolutionary science is changing all the time. With each new fossil find, or scientific discovery we learn more, and the edges of the map recede. New ideas like punctuated equilibrium shed light on some of the puzzles left in the fossil record. But at this stage in the game, the fossil record looks a lot like the Colosseum. Bits of it may be missing, but it's form and purpose are easy to discern.